Anti-wrinkle injectables are made from a drug called Botulinum Toxin which has been used for both medical and cosmetic purposes for over 20 years with no known adverse effects. The most important thing is that anti-wrinkle injectables are administered by highly qualified practitioners in a safe, medical environment. Yes of course you will. The ‘frozen’ look many of us associate with anti-wrinkle injectables is only caused when too much toxin is administered into one area. our practitioners target small specific muscles that are responsible for unwanted lines and wrinkles only. This means normal facial expressions such as smiling, frowning or looking surprised will be unaffected. During your consultation your practitioner will talk you through how the treatment can be used for subtle effects so no one knows your secret. The substance which is created in laboratories, temporarily weakens the muscle that are responsible for developing facial expression. This prevents the muscles from contracting and the skin is smoothed so that lines and wrinkles disappear. 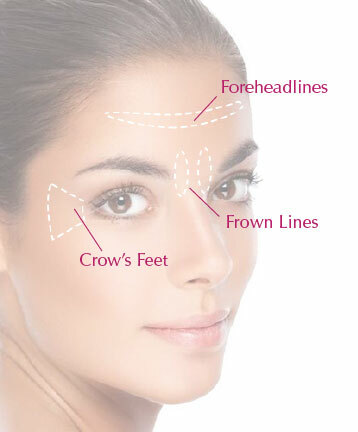 Anti-wrinkles injectables are mainly used for the face in three different sites – Forehead Lines, Frown Lines and Crow’s Feet. You can carry on with your day as normal immediately after leaving the clinic, although it’s important to avoid anything strenuous for 24 hours. Side effects are rare, but occasionally some clients experience bruising, but this usually fades quickly. The treatment will on average take 2/3 days to start working, with the full effects taking slightly longer. Treatment is not permanent and should be treated on average every four months.